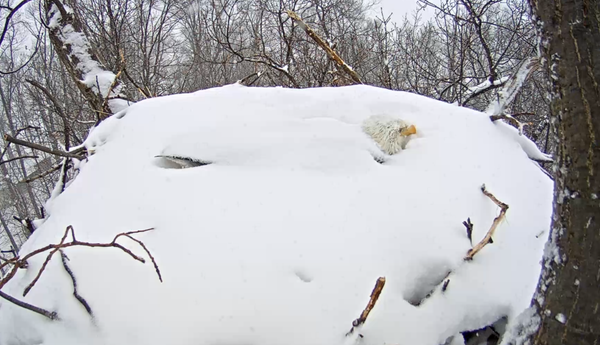 Talk about a devoted mom: This bald eagle let the snow pile up around her while she kept her eggs warm. 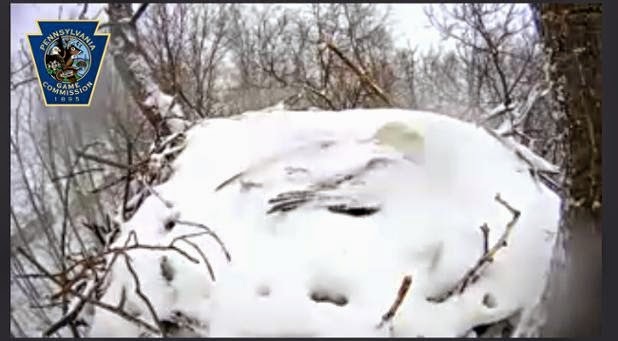 This snowy photo was snapped from a live feed of a bald eagle nest in Codorus State Park in Hanover, Pennsylvania. The mama bird withstood cold temperatures and driving snow to protect her babies. 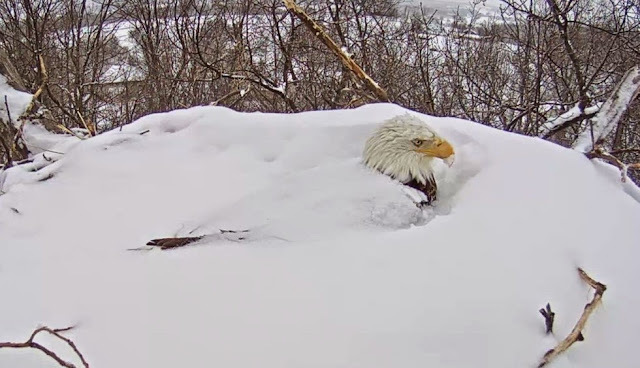 The images are from Thursday, when a winter storm brought several inches of snow, but if you check in on the live feed you can see things still look pretty chilly in the family's nest. 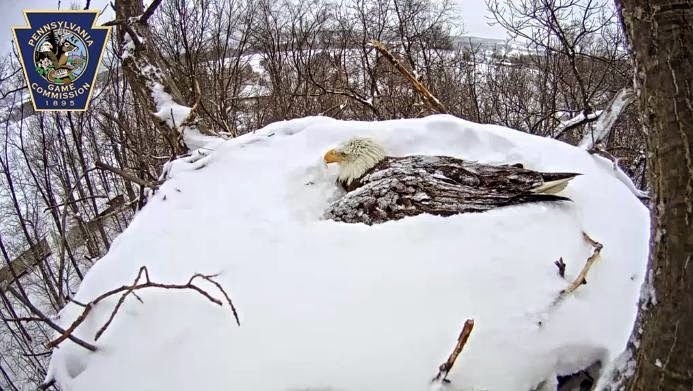 According to the Pennsylvania Game Commission, which hosts the live cam, bald eagles stay warm in the winter by fluffing their feathers and eating lots of extra food. Be sure to check back in on the nest once the weather warms up to see the little hatchlings! 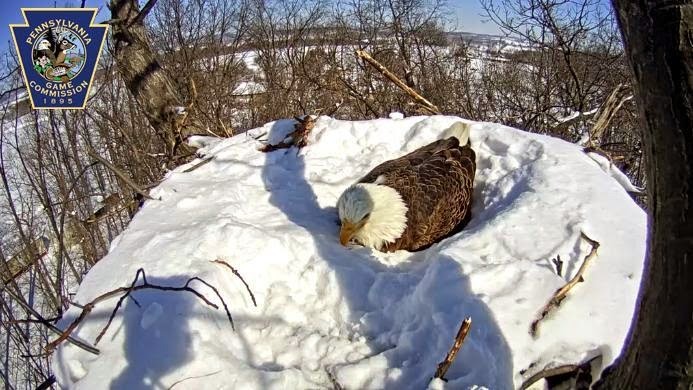 Responses to "Devoted Bald Eagle Mom Gets Buried In Snow As She Keeps Her Eggs Warm"
Shake it off, good mama, shake it off!!!! That is why Moms are so cool. Very special to be able to see this on film. I hope her mate is bringing her food. Amazing. I didn't know eggs were laid in the winter, thought it would be spring. @Barbara it depends on the country but January through March. Sometimes egg laying approaches in late February and March it depends on where you are. Tierno y maravilloso. Un canto a la vida.